Don’t miss it: on Sunday, June 9, bring your bike and join the massive Cycling Day (Święto Cykliczne) rally and ride that starts at midday from Plac Józefa Nowaka Jeziorańskiego – the square in front of the railway station. Cycling Day is an annual event with roots that go back to the late 1980s. Last year, about 1,500 cyclists turned up to ride through the streets of Krakow. This year, the theme of the rally is‘Connecting Krakow.’The route is cleared of motor traffic, which makes for a peaceful trip along usually busy streets. Similar rallies take place on the same day in cities across Poland. As cycle traffic continues to grow, the city’s infrastructure is lagging behind, and many regions remain inaccessible by bike. The Miasta dla Rowerów (Cities for Bicycles) advocacy group is calling for new traffic engineering regulations to facilitate urban cycling. The rally finishes at the Korona Stadium in Podgórze, but the fun doesn’t end there – stay for the Bike Festival! There is even a prize for the best fancy dress costume worn on the day, and don’t forget that you can dress your bike up too. Google Maps has recently added cycle routes for Krakow, and other Polish cities. It’s useful information, but not always accurate. A better option for planning a route through the city may be: ibikekrakow.com/mapa/. The green lines indicate dedicated cycling paths and the red lines are suggested routes in mixed traffic. risk of getting your wheels caught in the ruts. Ignore any drivers who honk – it’s just proof that they see you. Many one-way streets are also open to pedal bikes in both directions. Just look for the road signs. There are a lot of cycle paths in Nowa Huta, but they are poorly connected. A new cycle track is currently under construction on ul. Bora-Komorowskiego, and another missing link will soon be completed on ul. Andersa. Hopefully, ul. Mogilska will get its long-awaited cycle path in 2014, which will mean you can cycle all the way from the Rynek to Pl. Centralny legally and away from annoying traffic. 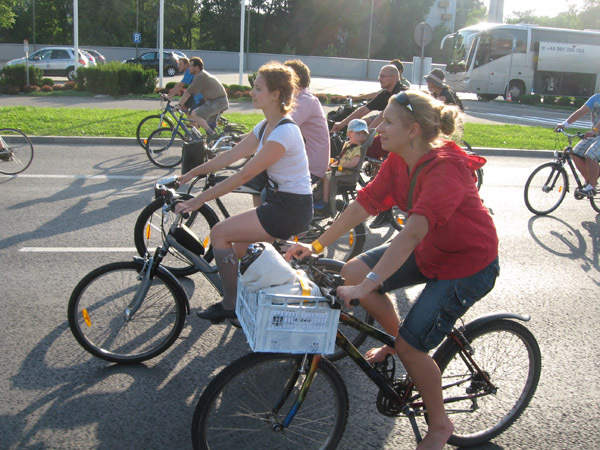 Krowodrza is quite cycle friendly, even without many dedicated paths – just avoid bu sy ul. Czarnowiejska and ul. Nawojki. There is a cycle path on ul. Armii Krajowej leading to the Widok estate. It is the southern parts of Krakow that are really problematic for cyclists. There is little or no cycling infrastructure, plus steep hills and arterial roads jammed with speeding cars. 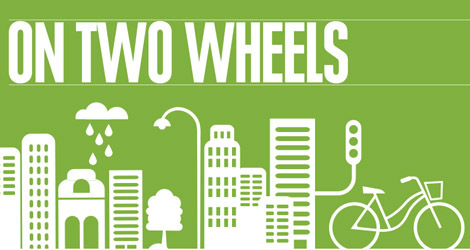 You may want to put your bike on a tram or a bus (legal and free, but the driver can ask you to leave if the vehicle is too crowded) and travel to more friendly regions. A few buses have exterior bicycle racks, but you must ask the driver for help. Perhaps the ultimate southern Krakow cycle path is the Trasa Tyniecka, which runs all way from Wawel Castle to Tyniec Abbey. A similar route has recently opened on the north bank of the Wisła. There is an extremely useful but little known cycle tunnel that provides an easy way to cross the railway tracks that bisect the north of Krakow. Situated just north of Galeria Krakowska, you can find the tunnel by leaving the cycle path in front of Politechnika Krakowska, on ul. Warszawska, and crossing ul. Pawia toward the railways tracks behind the vast and dusty parking lot. The tunnel emerges at a roundabout below the ul. Wita Stwosza flyover. From there, you can follow the marked cycle path to Rondo Mogilskie and its excellent, segregated routes well away from the cars. reaaaaally useful!!! looking forward to trying them!